A THIRD crocodile has been sighted in the Mary River, north of the Mungar boat ramp. A Department of Environment and Heritage Protection spokeswoman said the croc, some 2m in length, was seen by an EHP wildlife officer doing an overnight survey on October 16. "EHP can confirm two crocodiles have been seen in the Mary River and attempts to capture them are continuing," she said. "There are currently four crocodile traps in the Mary River." A larger croc, about 3.5m, had been seen in the Mary River on a number of occasions since May 2012, the spokeswoman said. A 3.1m female croc in the Mary River was harpooned by rangers on November 7 last year and taken to a Rockhampton crocodile farm. Any crocodile south of the Boyne River at Gladstone is targeted for removal. 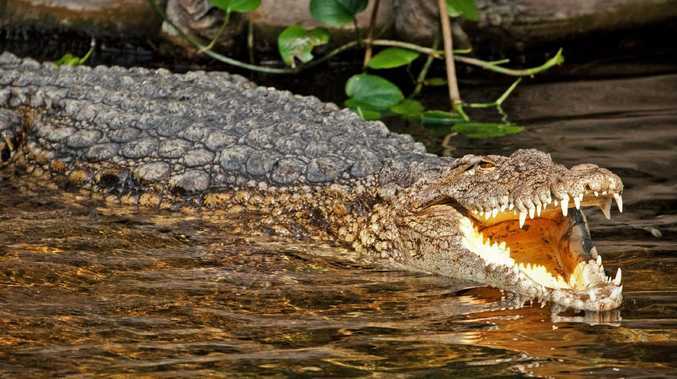 The EHP spokeswoman said boat users should stay well away from where EHP wildlife officers were working for safety reasons and to give them the best chance of catching the crocs. Crocodile sightings can be reported to EHP on 1300 130 372. More information on crocodiles and being "crocwise" is available on EHP's website at www.ehp.qld.gov.au.